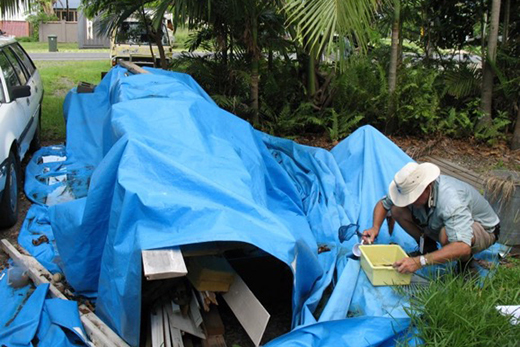 A public health worker collects Aedes mosquito larvae from water that has pooled on a tarp at a residence in Cairns, Australia. In fact, this novel approach for the surveillance and control of dengue fever – spread by the same mosquito species that infects people with the Zika virus – was between 86 and 96 percent effective during one outbreak, the research shows. By comparison, vaccines for the dengue virus are only 30-to-70-percent effective, depending on the serotype of the virus.